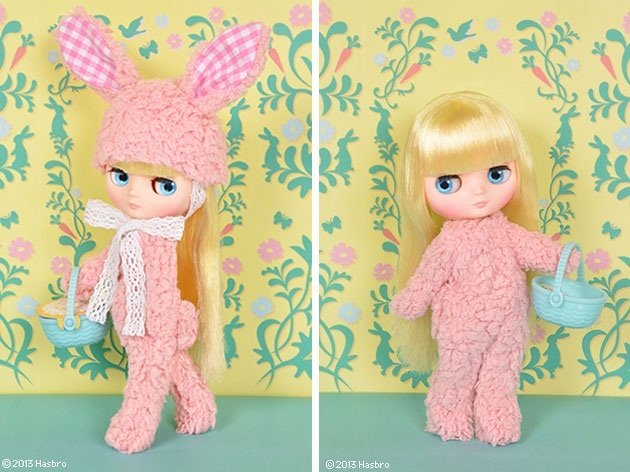 Snuggly and sweet, Middie Blythe wears a one piece animal suit with cute long bunny ears cap! Nellie Nibbles loves organic salad! 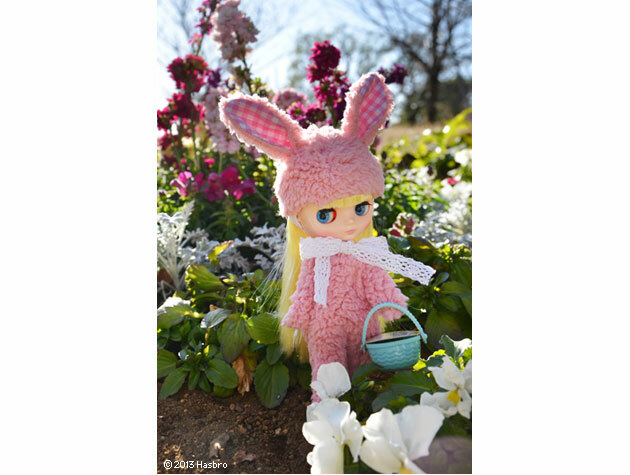 The animal suit and hat is made from a super fluffy material. 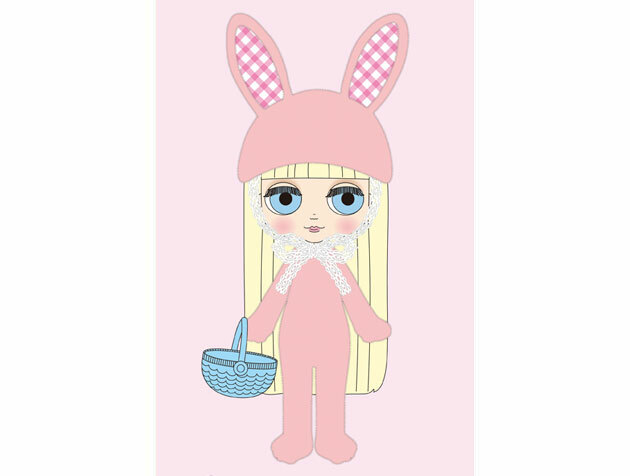 The inside of the bunny ears is accented with pink gingham. The cap ties with a sweet lace, giving it a sweet and girly touch. 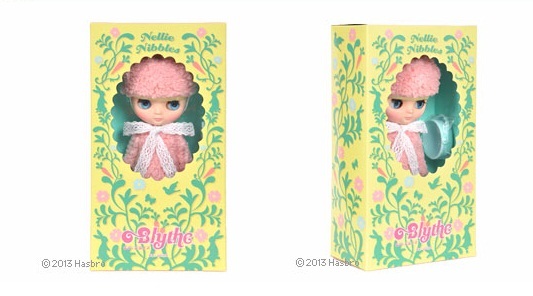 Nellie Nibbles grows her own vegetables in the garden. Her blue basket is perfect for gathering up all her fresh veggies. There is a special printing on the packaging where you can cut out the fruits and veggies to put in your basket! She has blonde, long straight hair with bangs. She wears brown eyeshadow, pink lips and pink cheeks. Her eyes are light blue. She's a lovely girl to wear all kinds of fashions! 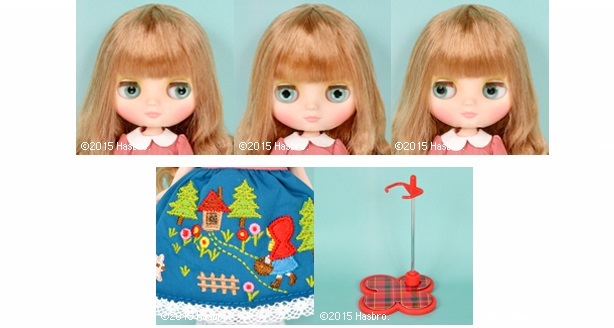 The set includes: Doll, animal body suit, cap, shorts, basket and stand. 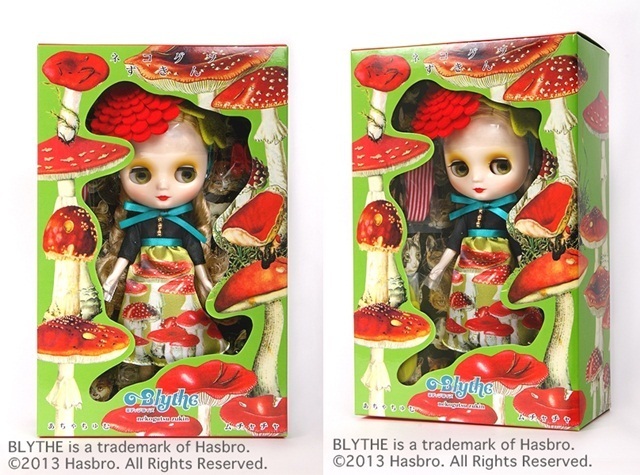 Middie Blythe Nekogutsu Zukin she is the guardian of the Miracle Mushroom Garden in the village of Muchacha, of the country of Achachum. The magical garden brings happiness to everyone in in Achachum. It is a strange and mysterious place! Nekogutsu Zukin's shoes are bright red with little cat faces on them. Legend has it when she walks, her shoes say "meow meow". 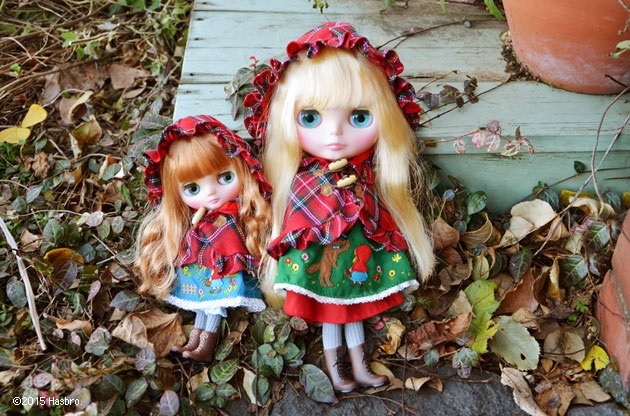 The denizens of Achachum are very fashionable and they love to wear cute hoods for their day to day fashion. 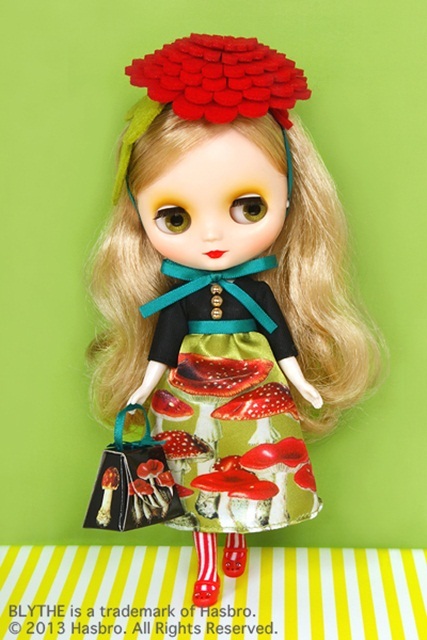 Nekogatsu Zukin wears a cute empire waist dress with a bold mushroom pattern. 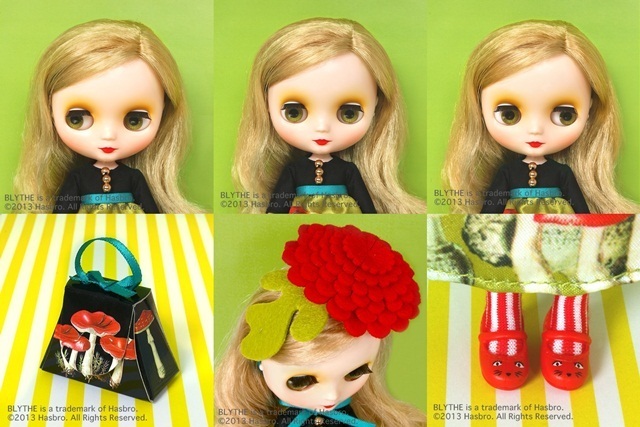 Her big red head piece is a lovely flower which ties under her chin. The bright petals of the flower attracts the gaze of the villagers. Her white and red striped tights are a great compliment to the mushroom print dress. She has long, light brown hair, set in a slight perm. Her makeup was chosen with the utmost consideration to match her fashion. She has fair skin and the lovely make up fives her a mature expression. She has light green eyes, the color of the woods. 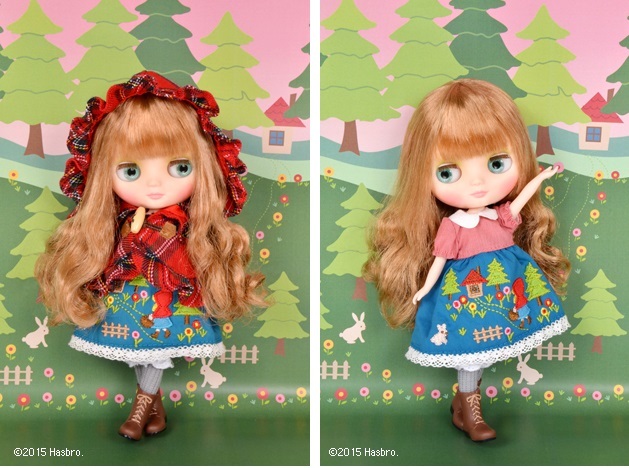 Skin type: Fair Set includes: Doll, dress, hair accessory, shoes, tights, shorts, bag, and stand.